Watch the YouTube video below and learn how to successfully Search Provo Utah Real Estate and save your favorite Provo condos and townhomes. You will also learn how to be the first to get the new Provo listings of condos as they come for sale. Our system will match your search criteria with the new listings. This is the best way to find a condo or townhome for sale. In fact, our system has helped hundreds of buyers find a condo. It is so important to be the first person to see the new listings. Search Provo Utah Homes Today! Instantly see all available condos and townhomes for sale in the Provo Utah area – and get immediate access to the most complete real estate data, including multiple photos, interactive maps, neighborhood statistics, nearby schools and so much more (we'd be here all day if we listed out every awesome thing). A buyer that wants to search Provo Condos needs to look no further than www.BuyProvoCondos.com. Provo Utah has the most condos for sale in Utah County. This is primarily because of Brigham Young University (BYU) and the age demographics of Provo. However, since the economic downturn the condo market was hammered. You could have found condos for about 40% off their highs. It is interesting to note that condos near BYU did not experience much of a drop during the economic downturn. They seem to be as solid as a rock. It is a very good time to buy a condo. Let us know if you would like to buy an Orem Condo. 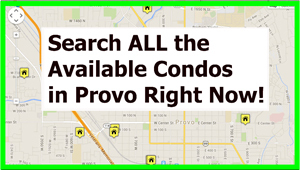 Search Provo Condos for Sale – Provo has a few luxury condos for sale. They are found in Country, The Academy Condos Meadow Condo, Slate Canyon, Castlebrook, Heather Park, Eden Derry Place, Marrcrest, Madison Park, Sunrise Village, Willowbrook, Mansion House, Copperfield Square, Lexinton Condo, Old Mill, Shire Court, Martinique, Morning Side, Park Ridge Pud, Westgate Village, Garden Villa, Bostonian, Grandview Village, Bel Courtyard, Riverstone, Evergreen Place, Riverside, eastgate Townhomes, Wellington, Deer Haven, Beehive, The Pines, La Jolla, New Bacon Condos, Quicksiver, Pioneer, Independence Ave, Windsor Park, Three Fountains, Brownstone, Slate Canyon, Eden Derry, Marrcrest, Belmont, Three Fountains, Mountainwood, Timpanogos, Chelsea, Alpine Park, Canterwood, Millrace, Arbors, Chatsworth, Oak Point, Avenues, Grandview Farms, Alpine Village, Lanai, Country Club, Arlington, Riverside Cottages, Trellis on the Green. Condos offer several advantages over single family homes. Namely, they are substantially less expensive per square foot, and they include very little land. Home Owners Insurance on condos is also cheaper than single family homes as the exterior of condos is usually covered by the monthly home owners association (HOA) fee. View Provo Utah Condos for Sale. If at any time you need help, can’t find what you are looking for, or want to request a showing you can contact me by phone Paul (801) 491-7653. If you’re considering purchasing real estate in Provo Utah and don’t have an agent representing you, I would love the opportunity to earn your business and help you with your real estate needs. You can find out more about me and read testimonials from my past clients. Search Provo Utah condos for sale on our website.